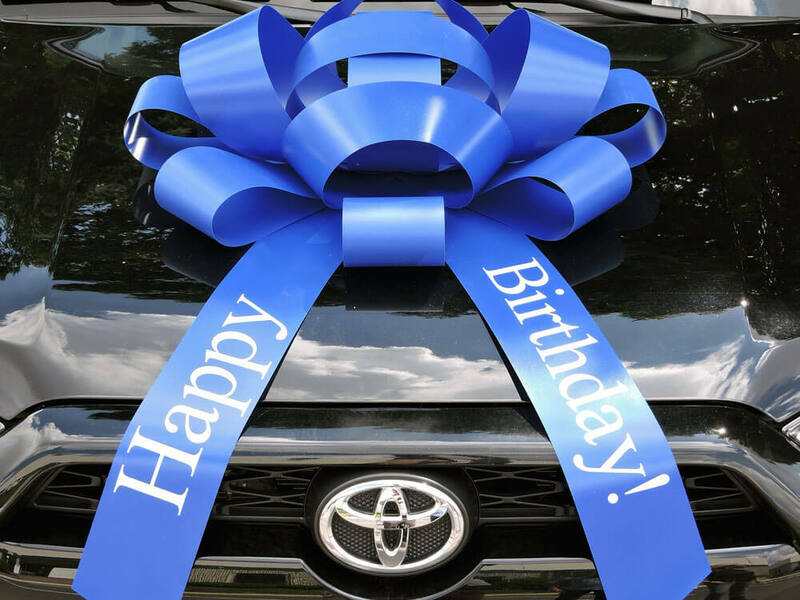 Your birthday gift will look amazing when you present it with the Big Blue Happy Birthday Car Bow ribbon, so order yours here and make someone’s day. This Happy Birthday Car Bow is blue, but other color options are available. Car bows are the perfect way to present a gift, and what better way to say Happy Birthday than with this huge Blue JumBow Car Bow. Make your gift look even more special and add that added special something by attaching a car bow to the bonnet or roof. The large car bow is easy to attach with the magnetic backing, and it can be used in any weather condition too. So if a birthday is coming up soon, make sure you say Happy Birthday properly by adding the Big Blue Car Bow. Make sure your birthday gift is really special with the Big Blue Happy Birthday Car Bow. The Big Blue Happy Birthday Car Bow is also available in White, Red and Pink, but we also have other messages like our Graduation Car Bow and Happy Holidays Car Bow. Also check out the Original Big Red Car Bow, the Car Bow with Suction Cup, and our Customized Car Bows. Once you have placed your order, we’ll send it directly to your door. With upgraded shipping options available your order can arrive at any USA address in 1-5 days.